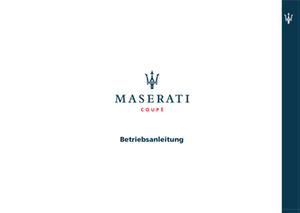 Maserati Coupé Betriebsanleitung 2002 - 2007 Maserati Coupé Betriebsanleitung 2002 - 2007 All of our instruction booklets and manuals for cars are always available and will be send without shipping costs within the Netherlands. It's very easy to order instruction booklets for all kinds of cars on Autoboekjes.nl. All the booklets we offer on our site will be produced at the moment they got ordered. We make use of our high-quality Printing On Demand Service with the same quality as a regular printed matter. The order will be send directly after production and shall be delivered at your address within 4 to 5 working days. We can send our products all over the world. The booklets will be send without shipping costs within the Netherlands. Information about the shipping fees outside of the Netherlands can be found on our site. We've got booklets from a lot of brands and at a daily base it's getting even more. It's always possible to look through the instruction booklets and manuals in PDF for free on our site. 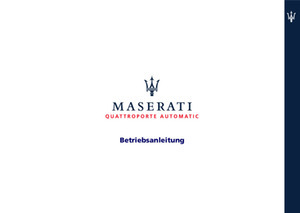 Maserati Quattroporte Betriebsanleitung 2008 - 2013 Maserati Quattroporte Betriebsanleitung 2008 - 2013 All of our instruction booklets and manuals for cars are always available and will be send without shipping costs within the Netherlands. It's very easy to order instruction booklets for all kinds of cars on Autoboekjes.nl. All the booklets we offer on our site will be produced at the moment they got ordered. We make use of our high-quality Printing On Demand Service with the same quality as a regular printed matter. The order will be send directly after production and shall be delivered at your address within 4 to 5 working days. We can send our products all over the world. The booklets will be send without shipping costs within the Netherlands. Information about the shipping fees outside of the Netherlands can be found on our site. We've got booklets from a lot of brands and at a daily base it's getting even more. It's always possible to look through the instruction booklets and manuals in PDF for free on our site.